Smartest Dog in the World? What do you think? the world. This is based primarily on how many human words the dog understands.Take a look at this short video and decide for yourself. I wasn’t surprised to find that is was a Border Collie, one of the most intelligent and responsive dogs anywhere. At TopTenz.net they have a list of the 10 smartest animals in the world. The Border Collie is listed as number 7 and according to them is the smartest dog breed in the world. See what a 3 1/2 month old Border Collie can do. This video was a pleasure to watch. Here’s another short video of the Austrian Border Collie showing understand of a number of words. No matter what dog breed you have I know that if you are like me, it doesn’t matter if they are the smartest dog in the world. They are our pets and to us they are just as smart as they need to be which leads me to unconditional love and I will leave it there. Well. I think that this Border Collie is right up there. I also think that this breed is topicality more intelligent than the majority of K-9. This is one of the hardest working dogs thriving on praise. 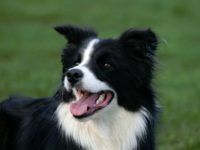 Border Collies are represented among the leaders in competitive levels in various sports, excelling in agility skills, obedience, sheepdog trials and Frisbee. .-= john silveira´s last blog ..Merry Christmas and then some , Horses Horses (-: =-. That is one well trained little pooch. Bert needs some lessons from her. She seems very clam and intelligent too. That helps. Thanks for the great video. Love your site. .-= Carol & Bert´s last blog ..Pembroke Welsh Corgi (Comprehensive Owner’s Guide) =-.